Get That House Summer Ready! BBQ's, Partying, or just relaxing in the yard on a nice sunny day are all things to look forward to this summer. Yet, in order to relax and prep yourself for all of your outdoor activities, you may want to check out this to do list for getting the outside of your home clean and ready for summer. -Clean the walkway- A little sweeping and power washing goes a long way! -Tend to your front door- Fix gaps with caulking. Use paint to touch up any chipping around your door, and who knows...maybe even paint your front door a new and cheerful color! -Prep windows- Fix gaps with caulking. Fill up 2 buckets, one with 1 cup vinegar, 1 cup ammonia, and 1 gallon hot water. Wash your windows with the vinegar/ammonia solution first then with water only. After, wipe down with a squeegee. -Check Those Fences- Make sure fence posts are sturdy and not wobbling in the ground when you give it a little shake. -Clean up your driveway- Sweep and powerwash. For black top try Blocktop Ultra Maxx 1000 Driveway Filler and Sealer. For Concrete try Quickrete Concrete Crack Seals. That baby will look good as new! -Spruce up grass- Remove dead grass and twigs with a rake. Fill in bald patches on your grass with fresh grass seed. -Clean out the Gutters- take out the ladder and scoop out all the dead leaves and twigs in your gutter. Next rinse them with a blast of water from the hose and you are good to go! -Hose Down Air Conditioning Condenser- Shut your electric panel and clear out any items lodged in the unit. Wash down all the coils with a hose. -Wash the Cushions- Outdoor cushions tend to take quite the beating. Use dish detergent, warm water and a scrub brush if fabric is not removable and scrub away. If fabric is removable, throw it in the washing machine. -Clean the deck- Sweep and powerwash. Also if necessary add another coat of sealer. -Scrub down the gas grill- Disconnect the gas line. Wash and scrub grates, burners, and drip tray in warm soapy water. 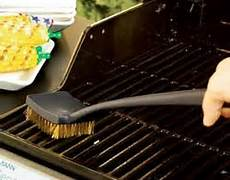 Wipe down the grills exterior then put all items back in place and attache gas line. Do all of this and you will be in tip top shape and ready to host all of your fabulous BBQ's and gatherings outdoors this summer! 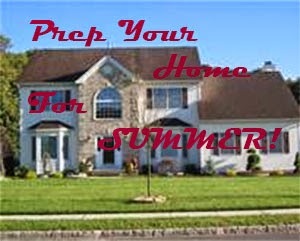 What is on your to do list for prepping the outside of your home this summer? I just started to get my yard summer ready and it is tedious! I did need to spray a Wasp nest so that was fun!